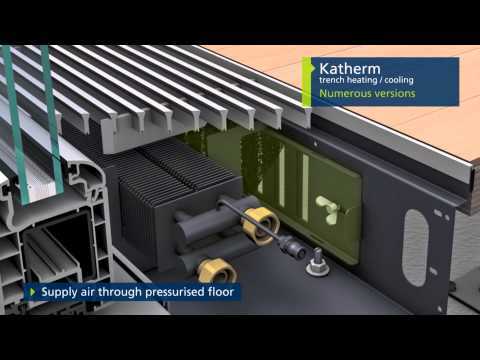 Katherm NE :Natural convection trench heating. What are the benefits of natural convection with an electric heating element? Katherm NE units operate silently with natural convection and fast warm-up. They are the solution when a LPHW or LPWW convector is not possible or planned. How are Katherm NE units controlled? Each unit is fitted with an integral output control for the electric heating element. Room control is provided by conventional thermostats (2-point). The output is controlled via an integral output switch. Is the group control of several Katherm NE units possible? Yes, this is possible without the need for any extra accessories. Every Katherm NE then has a separate mains power feed.